The three officer figures are from Miniature War of Italy. These were purchased during the Crisis convention in Antwerp and I found them to have a similar style to Old Glory. Each of the Labarum have a legion name and symbol which is useful when playing the basic 12 element a side game. In these instances, the Praetorians and II Parthica usually remain home in their box. Nice looking units, well done! 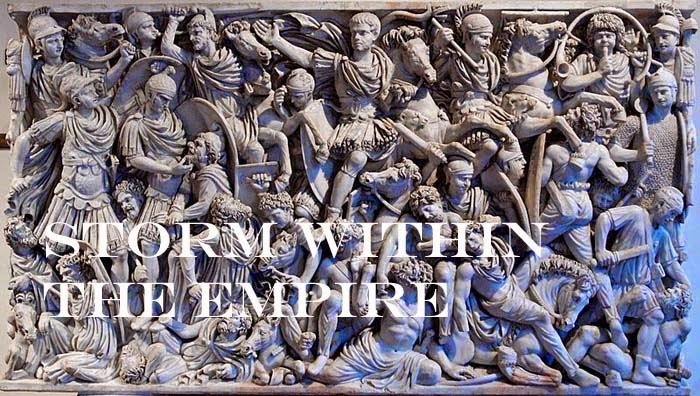 The Roman collection for the West are currently getting into a lot of battles against various barbarian armies. This Friday, it is back to Britain to fight the Picts. Omg I feel yet another project looming! I sold my Late Romans on Fleabay and now I want another!!! My Late Imperial Romans were collected during the same period as my Sassanid. However, the LIR were cannabalized to fill out other collections which were sold a few years back. As the Sassanid have been repainted and now cover all three sub-lists for 3.0, I am now currently doing the same for the LIR. New figures have been bought and are currently under the brush while the surviving elements wiill be repainted..
Additional figures will be purchased to expand the LIR to Patrician (Eastern) Roman to continue the fight against Sassan. All this will be covered in future postings.